Long ago, before I knew much about the internal workings of churches or denominations, people who loved me told me stories about the person of Jesus, and that encounter changed everything for me. Their stories engaged my imagination to consider an alternative way to live, which I eventually claimed as my own. And, I would imagine, the same process is similar for everyone who has decided to follow Jesus and then become a leader in the church. At its heart, ministry is not about the success or longevity of a particular expression of church, like one’s congregation or even denomination; it is about offering to others “an alternative narrative to live,” which, of course, involves being nurtured and accountable to a Christ-following community, whatever its form may take. Indeed, Christianity itself, as Gil Rendle writes in his brilliant book Doing the Math of Mission, “is a different way of understanding one’s world and living in that world that is based not on the power of the culture but on the alternative story from God that makes forgiveness more important than winning, that makes being part of community more meaningful than seeking to control others. At the heart of ministry is the changed self that comes from an encounter with the presence and story of Christ.” As ministry leaders, if we lose sight of this, we lose everything. With this in view, I’m inspired by leaders and congregations around our presbytery who have chosen to put God’s story before their own by paying attention to what they see God doing in their cities and neighborhoods, and then redirecting resources to that work, even when doing so involves laying aside their own preferences and plans. This is what Norwalk Presbyterian Church did at February’s Presbytery Gathering when they transferred title of their campus over to the Shin Il Presbyterian Church. 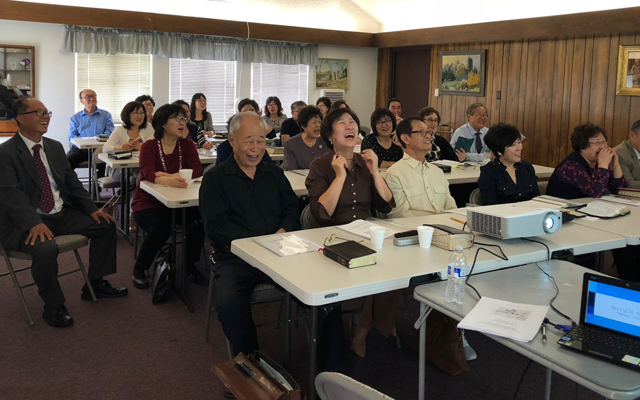 Norwalk’s leadership was paying attention to the changing mission field around their campus, whose population over the years had become increasingly Korean and Latino. 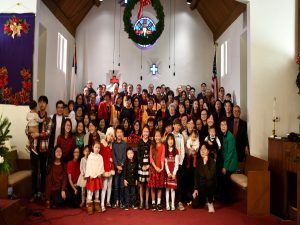 So, as they continued to meet and worship, they welcomed the presence of Shin Il Presbyterian Church, a Korean-American congregation, and more recently, Esperanza Viva, a Spanish-speaking New Worshipping Community. But, as these fellowships grew, the challenge of maintaining the buildings grew with them, which prompted Norwalk and Shin Il to imagine a different relationship. They began to wonder if it was possible to switch roles, which led them to seek the presbytery’s approval to transfer the title of the real property to Shin Il. That discernment led to February’s meeting, where the two groups officially flipped their roles for the sake of reaching more people with the story of God’s transforming love. They had a higher purpose in mind, a better story to tell. 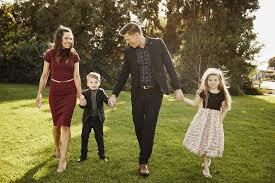 Bobby and Hannah Schuller with their family. Another congregation that is telling a better story is Irvine Presbyterian Church. Instead of thinking “Woe is me” when over half their members transferred to another denomination, their leaders prayed for how God could use them in a more dynamic way in the future. After a season of possibility hunting and discernment, God answered their prayers by bringing Shepherd’s Grove Church to partner with them. Now, as of the last Presbytery Gathering, they have merged into one congregation called “Shepherds Grove Presbyterian Church,” which makes them not only the largest congregation in our presbytery but the only one with a TV ministry reaching people all over the world. Another congregation that is telling the better story is St. Mark Presbyterian Church of Newport Beach. Through the leadership of their pastor and elders, they have convened and hosted multiple events to end homelessness in Orange County. Humanly thinking, one may say, “Ending homelessness is impossible!” But as the months have passed and the politicians have met and the business leaders have come on board and the faith communities have mobilized (whew! 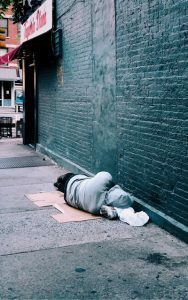 ), it seems increasingly within everyone’s grasp to significantly reduce the number of people who experience chronic homelessness. As I reflect on these movements, I’m aware that none of them could happen without deeply committed communities who have been transformed by God’s bigger story of loving creation back to wholeness. It’s so easy to get preoccupied with one’s own story and miss the role we can play in God’s larger work—but these communities have not only resisted that temptation but overcome it. God’s alternative narrative gave me a reason to live when I was very young, and it still moves me today. Being in relationship with congregations that seek God’s higher purposes and strive—sometimes against all human impulses—to tell a better story, and then to see the impact they have on people’s lives, is confirmation that God is powerfully at work far beyond anything I could imagine or manufacture on my own, and is worthy of all I can give.